When you are searching for your wallet, there are a lot of things that you need to consider. It starts with the types of wallets that you want to buy, the capacity of the wallet, and how much you are going to pay for your wallet. One of the most important features that you need to consider is the materials of your wallet. Like other features, there are a lot of choices. You can choose among leather, polyester, cotton, and even metal. There are some other unique materials like duct tape and Tyvek, to name just a few. Each of these materials has their own pros and cons. 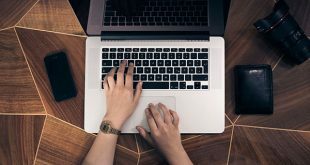 When you know about these strengths and weakness of the most popular materials, you will be able to narrow down your search. As a result, you can choose a wallet in a shorter amount time. So why don’t we discuss about these popular wallet’s materials now and see which one is the best for all of your needs and preferences. The leather is one of the most common types of materials that you can see in a wallet. There are many types of leather as well, including cowhide, full grain cow leather, and horse leather. Some types of leather will be smoother and suppler. Some, on the other hand, is tougher and more rigid. 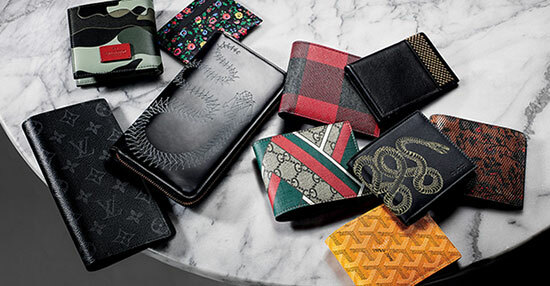 Nevertheless, all of them bring a comfortable feel and a luxury look to the wallet, regardless of the styles and designs. The leather material is one of the softest and smoothest types of materials. It makes any leather wallet smooth as well to bring a very elegant touch to it. In addition, given how smooth the leather is, the wallet is hence comfortable for you to carry. It also makes it easier for you to slip the leather wallet in and out of your pockets. The leather is tough and durable, which can last for a long time. Hence, it is a great choice for you if you are looking for a wallet to use for several seasons. Not only does leather make the wallet durable and long lasting, it also makes the wallet look even nicer over time. Leather could possibly the type of material that can age nicely. When you wear a leather wallet for a long time, you will start to see new marks of daily wear and tear. These marks will blend well with the texture of the leather and add more elegant to the look of the wallet. In addition, since the leather is one of the most popular types of materials for wallets. As a result, you can find a wide range of leather wallets with different types of styles on the markets. No matter what you like, you will always find one that meets your needs and preferences. Last but not least, a leather wallet is a very versatile accessory. You can use it when you wear a suit or a formal wear. Or you can carry your leather wallet as an everyday carry with your casual clothing. While leather is tough and durable, it is not water resistant. You shouldn’t bring it along with you when you take part in a water activity or sport. The leather is not the thinnest types of material. It can get thick and bulky, especially when there are layers of leather which are stacked together as separate credit card slots. When you just buy a leather wallet, you will notice that the credit card slots tend to be stiff. They then can be stretched to fit your cards nicely but it surely takes time. You can find leather wallets in different price ranges. 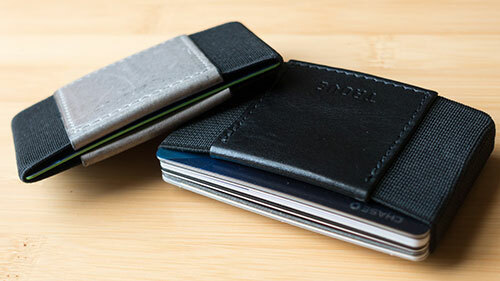 Some mass-produced wallets are generally affordable. Still, they will cost more than other materials. 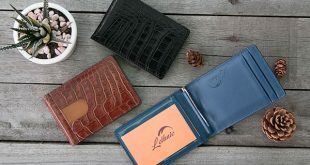 Not to mention that some wallets which are handmade or customized with the top premium leather can cost you about 200 to 300 dollars, or even more. Last but not least, you need to care more for your leather wallet to make sure it last. Washing by hand and applying leather conditioning are two steps you should do regularly to increase the durability of your leather wallet. This type of material is very popular, especially when you are looking for an everyday carry wallet or a minimalist wallet. 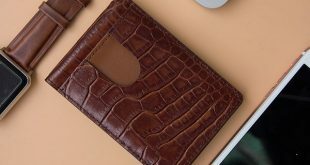 The reason for this fact is that the elastic material would help the wallet to have the slimmest and most compact size. Imagine how a rubber band works and you will know how an elastic band works. This type of material makes the wallet very thin and slim. If you want a wallet with the maximum slimness, this material can guarantee you that. You can easily slip this elastic wallet into either your front or your back pocket. Unlike the leather wallets, most of the elastic wallets on the market are relatively cheap. You can buy an elastic wallet online which cost you only a few bucks. It is flexible. You can store just a few cards and that is fine. If you want to put in more cards, the elastic wallet can accommodate for that. You don’t have to worry about wearing a big but empty wallet or a fat wallet at all with this type of material. You might see below that one of the main problems with an elastic wallet is that it has a few card slots. This might be a good thing for you though. You will need to think more carefully about what you put into the wallet. As a result, you will get rid of all of the things that you don’t need and become more organized. It is easy for you to search for the cards or the bills that you need inside an elastic wallet. When you have just bought an elastic wallet, the credit card slots might be too tight. It is therefore quite difficult for you to slip your credit cards in and out. However, after you use the elastic wallet for quite a while, these credit card slots might become too loose. As a result, the cards inside these slots might fall out easily, making it not secure at all. The life of any elastic wallet is quite short. As I mentioned above, the credit card slots might become too loose over time. In addition, the elastic material is not as durable as other types of materials such as leather. To keep an elastic wallet at the slimmest design as possible, there would be just a few slots for cards and cash. Hence, it could be a little bit unorganized for you. If you want to store a few banknotes in the elastic wallet, you have to fold the notes for several times. And the tension of the wallets might cause damages to these notes as well. The most common materials which are used as a metal wallet are the aluminum and titanium. They have the similar styles of the elastic wallet. You can also this material popular in minimalist wallets. It is hard to find any bifold or trifold wallet made from metals. Most of the metal wallets come with a single frame or a set of plates for you to put all of your cards in between. Along with the metal body, there is an elastic band or an O-ring to keep hold of these cards. A metal wallet is generally very tough and durable. It is highly resistant against impacts, shocks, drops, and bumps. It is also resistant against all factors of weather. Not to mention that it is water resistant as well. 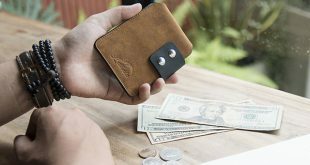 Most of the metal wallets on the market come with just a few credit card slots. As a result, it is very thin and slim fit. The surface of a metal wallet is very smooth. Along with the slim fit design, you will see that it is very easy for you to slip the wallet in and out of your pockets. A metal wallet also has the same strengths of the elastic wallet. It has just a few slots so that you can become more organized and get rid of all of the items that you don’t need. It is also quick and easy for you to open the metal wallet and look for the cards that you need to use. In case you like something which is out of ordinary and want to own things which look like cool and well-engineered gadgets, a metal wallet is your best choice. 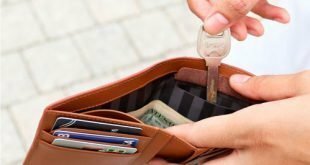 If you often slip your wallet into your front or back pocket, you will see that a metal wallet might cause discomfort for you, both when you walk and when you sit down. In addition, the sharp edges of the metal wallet might wear down the fabric of your trousers. Not only do the sharp of the metal wallet cause damages to the fabric, they also cause damages to other gears. 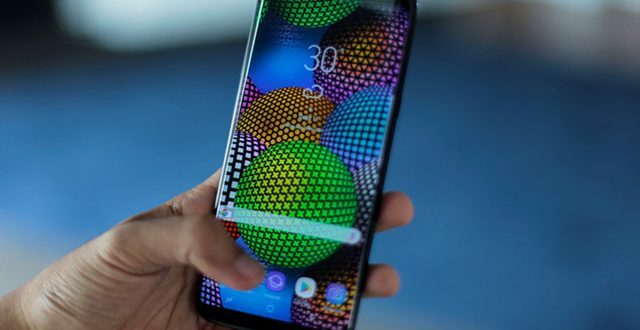 For example, when you put your phone inside the pocket with your wallet, the metal wallet will lead scratches and marks on the surface of your phone. The metal material is highly resistant itself. When you put it with other sharp items such as your keys inside your pockets, these sharp items can leaves scratches and marks on the surface of the wallet, making it less shiny over time. Metals are heavier than leather or elastic materials. 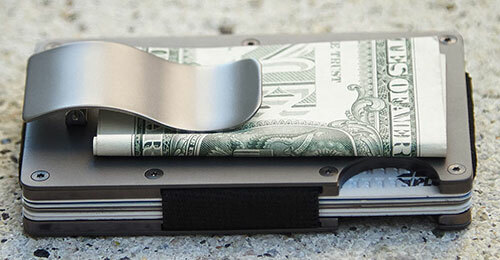 The most lightweight metals you can choose for your wallet are aluminum or titanium. The last material that I want to discuss about is polyester. Polyester is not the natural material. It is processed from artificial fibers. There are many types of polyester that you can find on the market. Still, they share the same features, pros, and cons. The polyester is the great substitution for the leather. You can find this material in a wide range of wallet’s types, from the traditional bifold and trifold wallet to the minimalist wallets. While the polyester is vulnerable to cracking and UV damage, in general, it is very durable and scratch resistant. 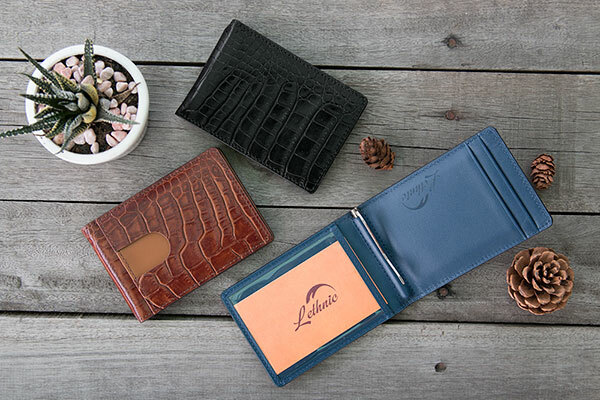 When you are searching for a wallet made from leather, your choice of color is pretty limited. You can only choose among the most basic colors such as brown and black. On the other hand, if you want to search for a polyester wallet, you can pick among all types of colors possible. You can choose the most basic and neutral colors like black and brown as usual. You can also choose a much more vibrant color like red, yellow and green. A polyester wallet will never be as expensive as a leather wallet. If you don’t want to spend a lot of money on a wallet, go for a polyester wallet. It is very easy for you to clean your polyester wallet. Just a few simple wipes with a clean cloth. The main problem that makes many people refuse to choose polyester for their wallet is that it is not an eco-friendly material. First of all, it would take a lot of time and energy to produce this unnatural material. In the process, chemicals are used as well, emitting greenhouse gasses and chemicals. The second reason is that polyester not biodegradable. While a piece of leather only takes 50 years to be biodegraded, it takes a piece of polyester more than 500 years. A polyester wallet, especially the one which has the colorful design, is more suitable for a casual occasion only. While people don’t pay much attention to the formality of a wallet as much as they do for a pair of shoes or a watch, it can still leave a bad impression when you wear such a causal wallet to a business meeting. Especially when your business partner pays much attention to what you wear. As you can see, the material plays a very important part in deciding the designs and the usability of the wallet. The choice of which material you should go for is up to your preference. If you like something traditional, go for leather. If you like the minimalist style and want to keep just a few cards; go for the elastic material. And if you like something which is super rugged and looks like a well-engineered gadget, go for a metal wallet. 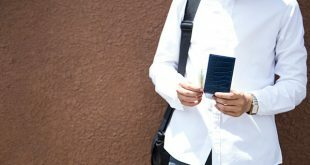 Other materials you can consider when choosing your wallet are cotton, silk, and plastics. I hope with all of the information about these material’s pros and cons above, you have a better idea about the strengths and weakness of different types of materials. With such information, I am sure that your search for the best wallet is quicker and easier.